You all have known me long enough to know I love made in the USA. But what I love even more is things handmade that are actually one of a kind and very reasonable. I happened upon this web site I believe through Livingsocial.com . I fell in love with these pieces of jewelry and what a great way to support an artist living in the USA. Birmingham, AL to be exact. Necklaces, earrings, bracelets.. ALL very nice. Ok you shopping for your favorite Alabama fan or you know elephants are a symbol of good luck and we all can use that.. 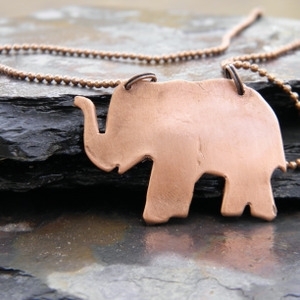 Here is an elephant necklace. 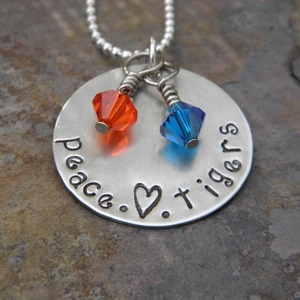 I being an Auburn fan and and old hippie..I loved this. So if you need to get that special someone in your life a gift, here it is! You probably could get your team on one of these. Everybody knows somebody that is having a bundle of joy arriving . This would be something special they could keep forever and even pass down to their child when they are awaiting for their own bundle of joy to arrive. You could make this a family tradition. Get one for you and pass it to your child and they pass it to their child on down the line. 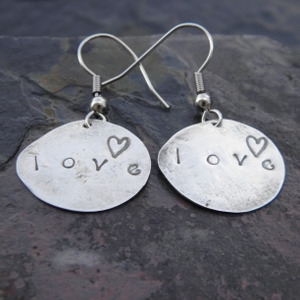 What the world needs is more love and you could spread it around with a pair of these earrings. 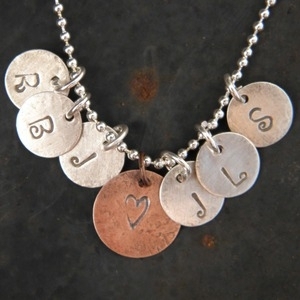 This would be an adorable necklace for a mother or grandmother or you could even have just your and your spouse name put on there. It would be cool to spell out your own name. Look I could go on and on about what Rececca has on the site but why do you just not go to www.jennarosityllc.com and see and shop for yourself. I am sure you and she could work something out. You know when I find MADE IN THE USA..I am going to pass it on to you. We need to support the artists in the USA! Go there and look at all the pretties. Let me know in a comment what you think. When I contacted Rececca and asked for permission to blog about her company and asked her about it, she said she was located in Birmingham, AL and that she hand stamps every piece. Now how cool is that?? Made in the USA and her prices are very reasonable. That special gift you need for Christmas or whatever occassion could be personalized and just what you are looking for. Something no one else has. Christmas is coming very soon! This entry was posted in Advertisement. Bookmark the permalink.